Sometimes the one you love can be demanding. When support is missing, and in its place is only the cold glare of expectation, performance and energy can dip to apathetic lows. Or they can be funneled into a new project that reclaims some of the earlier happiness. 1000 Palms is a Surfer Blood reclamation project, a rediscovering of what made things work in the first place. On “Covered Wagons,” a light-hearted beach ditty with just the right hint of melancholy, John Paul Pitts sings “the ribbons cut/with rusty blades.” The separation has been messy, but it’s finally done. The album opens boldly. “Grand Inquisitor” is offbeat guitar warbling and hectic, almost desperate singing that feels like out of breath proclamations. Then things change, the movement ceases, the guitars become clear, and the warble is freed to heavy riffs. Though the vocals continue in the same breathless pattern, they are exclamations instead: “walk right in you smell of tea and flowers/where have you been.” All of this happens in the last minute of the song, but with the brevity of the entire track it works perfectly to create tension and release. While it serves be a perfect capsule of how to introduce an album, “Grand Inquisitor” can also sit apart as a lead single. 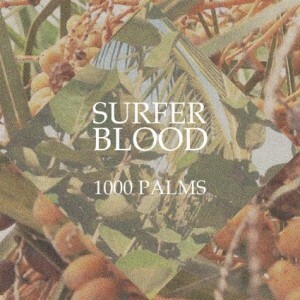 1000 Palms is filled with hope because the music is deceptively good. Maybe that’s a description wasted on a former buzz band whose sophomore album and major label debut wasn’t up to snuff, but it’s true. 1000 Palms is lo-fi craving, with all the right words in place, and all the right emotions seeping through without being too melodramatic.